Hypothermia is a real concern for construction workers during the winter, and even fall season. We are currently in the thick of the flu season. Tissues and chicken noodle soup are in high demand this time of the year. The dramatic change in temperature does not only cause a lot of people to become sick, but it creates hazardous outdoor working conditions. The good news is that there are plenty of steps site managers and construction workers can take to beat the cold temperatures and stay safe. Keep reading and discover a few safety tips for working on construction projects in cold weather. It is important for site managers to closely monitor weather forecasts during the colder months of the year. Hypothermia is a real concern for construction workers during the winter, and even fall season. It can be extremely dangerous to sweat in frigid temperatures. If possible, try to schedule construction projects around the weather forecasts. Also, try to schedule projects to be worked on during the warmest parts of the day. It is important that construction workers are always dressed appropriately for the current climate. For that reason, it is a good idea to have plenty of warm clothing such as hats and gloves on hand. Site managers should have extra articles of clothing for workers who need it. One of the best ways to beat cold temperatures is to take frequent breaks in warm environments. If the temperature is not hospitable, there should be a place on or near the worksite where workers can escape to get some relief from the cold. It can be dangerous for construction workers to be outside for several hours in freezing temperatures. 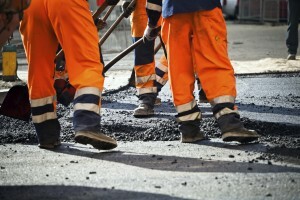 By taking these breaks, it should help to make construction workers more productive. This entry was posted on Monday, October 22nd, 2018	at 3:47 pm	and is filed under Construction Industry	. You can follow any responses to this entry through the RSS 2.0	feed. Both comments and pings are currently closed.